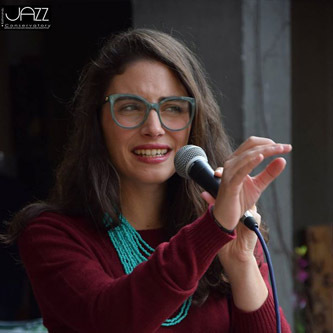 Marta Del Grandi, an Italian Jazz Vocalist/ Songwriter, a dear friend, and a volunteer teacher to our KJC family, is here with us again for a second time- 2014 being her first. Our ties with this gem of a musician have lasted for the past two years, as she not only helped as a volunteer teacher here at the Conservatory, but also helped recruit new people/volunteers/musicians from around the globe. She had some very humbling things to say about KJC- “The fact that KJC is open to so many different inputs at once, and the very essence of it being versatile makes KJC what it is today. It allows itself the privilege of taking different directions all the time, with new activities always on the ready, and it’s effort to do a myriad of things for a lot for people who are here for a short period of time. KJC is a great place for collaboration, and an even better place for people to meet and have an exchange of their artistic Work. Furthermore, the fact that this is in such a warm and vibrant country makes the energy here very special. Nepal, and the way things are here is very different from Europe or China or any other place I’ve lived in, Nepal is something else. The whole KJC vibe and the community in itself is strong because of the kind of similar artistic values people share”.